There are decided advantages to being way behind on your blog. You have a TON of projects to share to catch up! So here is one of those projects. To say that First Birthdays have taken on a life of their own is an understatement of mammoth proportions. At least around here. Little Girl's first birthday was in the fall. She really couldn't have chosen a better time to be born because the weather here in October is delightful. Momma decided to celebrate her birthday here instead of NOLA. This Mimi was only too happy to oblige. Her cake came from Sarah's Cake Shop. 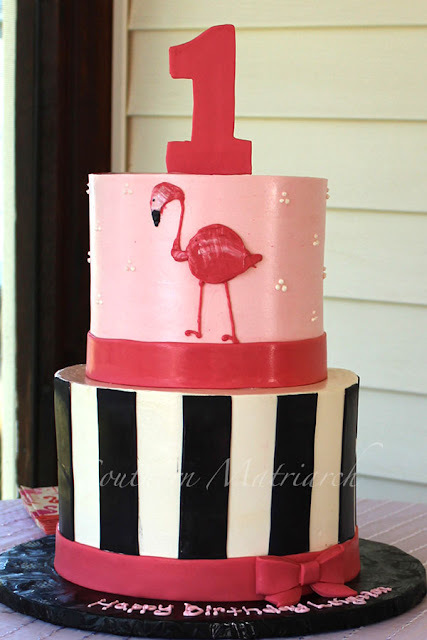 I have ordered a few birthday cakes in my time, and they were one of the easiest to deal with by far. And sooooo nice. White: as defined by Webster's Dictionary is "free from color." Don't anyone tell LG's Momma. It is her favorite color! And don't go trying to spruce up her white either. I have a stash closet full of some realllllllly nice fabric. Some tone on tone, some white dimity, some Swiss leno windowpane, and some quite expensive too. No, Momma wanted plain white. She did agree to Swiss Flannel. SO that is what we went with. I love how it turned out but still, I could have used a little lee-way. I inserted more color with the Swiss eyelet insertion and edging at the sleeve. 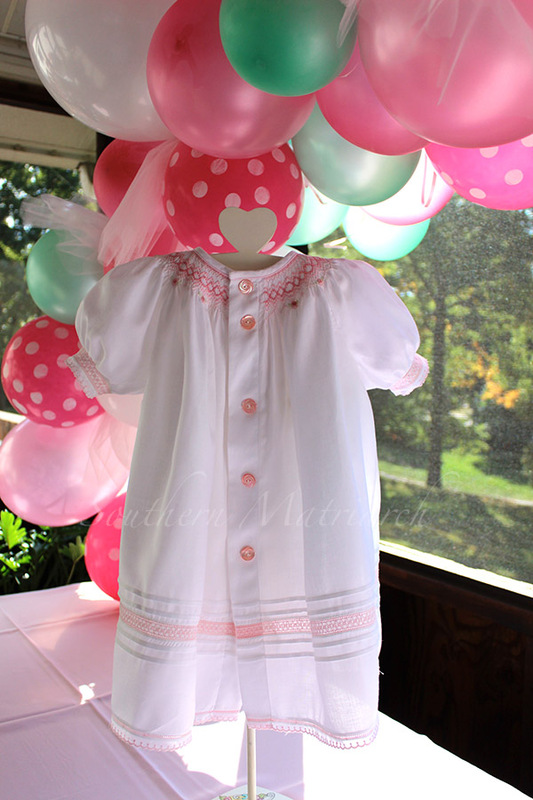 This dress is a pretty close copy of one a friend did several years ago for her daughter. I loved it so much, I filed the idea away for later. I hate that the dress doesn't have a slip under it in this picture. It looks much better with the slip under it. 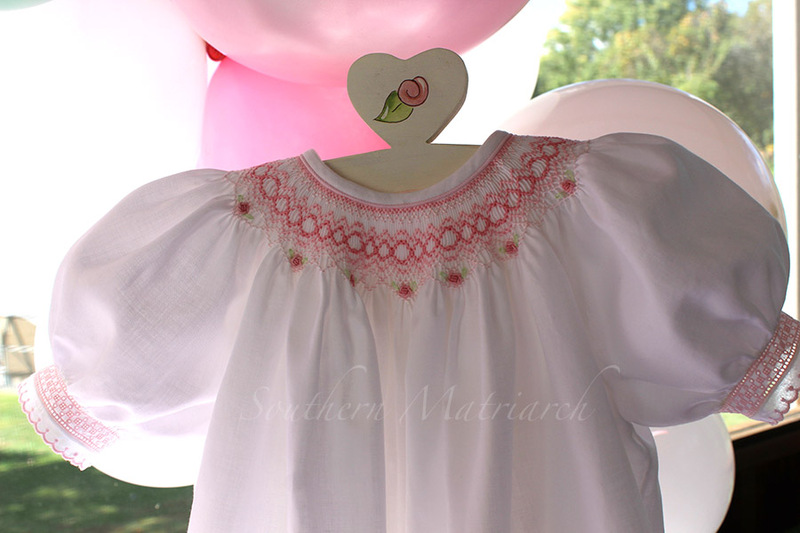 It is smocked in different shades of pink. I used "Baby Blue" as my smocking plate from Australian Smocking and Embroidery and the neckline is piped with pale pink pique, I think. 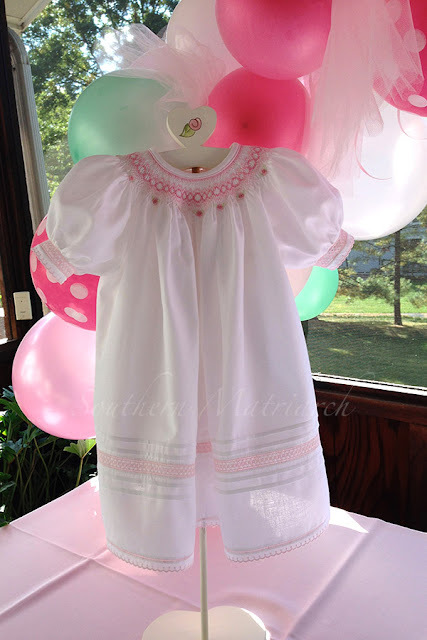 The pattern I used is from Gail Doane's book Sew Cute Couture. The Swiss flannel came from Farmhouse Fabrics. It buttons all the way down the back and is closed with more antique mother of pearl buttons. At the time the buttons didn't look too big, but now they look huge to me. Oh well, she was adorable in it with her pink t-strap shoes. For her portraits Momma had her go barefoot. Which I love. Happy Girl. I love those tooties covered in grass. If only they would stay this little. I have more birthday sewing (of course I do) in a day or so. Until then, keep stitching. Thank you. 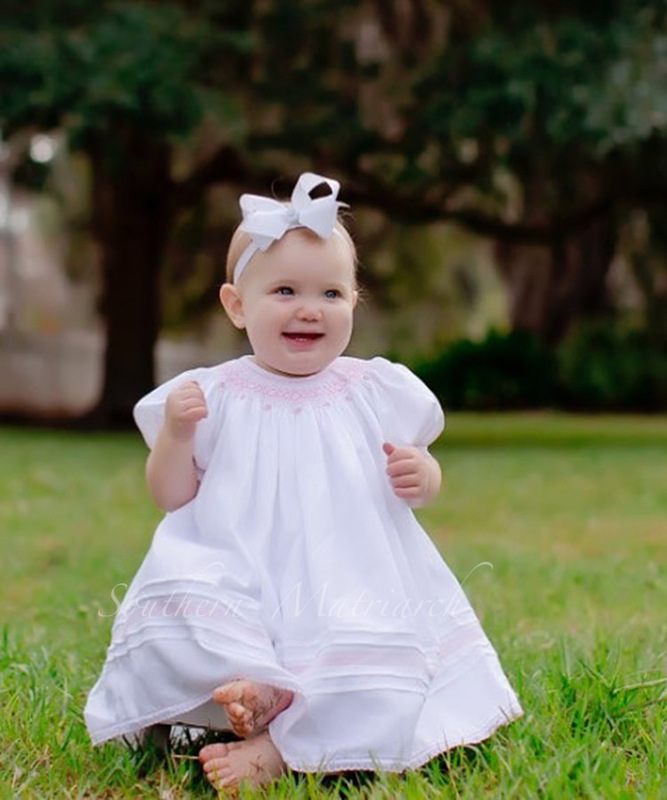 She is a sweet girl and Bentz Photography does a fantastic job. Easter Bunny has Come and Gone!